Edgar A. Francis Honored on 93rd Birthday. Edgar A. Francis, one of several Montpelier nonagenarians, received his friends, relatives and neighbors yesterday at the home of his daughter, Mrs. Herbert W. Thresher, at 427 Elm street, entertaining them with his fund of stories from an accurate and apparently inexhaustible memory. Born in Plainfield, July 28, 1846 [sic], the son of Charles Sylvester and Betsy (Pike) Francis, he came to Montpelier with his parents at the age of 8 years, and has continued to make this city his home. His eyesight is undimmed, he reads without glasses, but his feet give him some trouble by swelling, so that he cannot wear his shoes, but as he remarked yesterday, "I guess I could stir right lively if I heard a gun." A neighbor, Mrs. Charles Wiggins, who lives on the same street, went to school with Mr. Francis 84 years ago in Montpelier and they have great pleasure in reminiscing on those days. Another friend, George A. Peck of 166 Elm street, is a Civil war veteran, although belonging to another regiment, the 13th, in company I, and as they rode together in the Memorial day parade, they visited together about those days. Mr. Francis joined the 2nd Vermont infantry from Waterbury August 20, 1864, at the age of 17 and saw considerable service. He says that he was a rugged lad, and one can believe it, for he still gives that impression with his red cheeks, his stalwart frame and his alert look. Because of this endurance he was given hard tasks, and one of them was to assist the cook the day of the Battle of Cedar Creek. He was detailed by the captain to go to the rear with the coffee, several pounds, and two large sheet iron kettles on that eventful day. He had been in the army but a few days and did not know one flag from another or which brigade he was supposed to belong to., Forced to run, he finally found his regiment, but the telling is most amusing as the aged man recalls little incidents of that run. A sister died four years ago and a twin brother and sister died in the last century, many years ago, so that Mr. Francis is the last of his generation. He has a daughter, Mrs. Wesley F. Turney of Plainfield, a granddaughter, Mrs. Thresher of Montpelier, and two great-grandchildren, Howard H. Thresher of Montpelier and Mrs. Glenn Rogers of Burlington. His birthday was made a very pleasant occasion, for he received many callers, and many gifts, especially of flowers and candy. There was a family dinner party at noon at Mrs. Thresher's and a birthday cake to grace the table. Edgar A. Francis, 94, last of the Civil War soldiers in this city, died this morning at 5 o'clock at his home at 427 Elm street after an illness of two months. His service in the Civil war was with Company D of the 7th [sic] Vermont infantry from Waterbury, and his commanding officer was Colonel Amocey Tracy. He was born on July 28, 1847, in Plainfield, a son of Charles S. and Betsy (Pike) Francis. He was twice married, first to Miss Fanny E. Thayer, who died in 1908. His second wife was Mrs. Arabell Coffey, who died in 1934. Since her death he lived at the home of Mr. and Mrs. Herbert Thresher, where he has been tenderly cared for during his declining years. Mrs. Thresher is his granddaughter. He belonged to the Brooks Post, G.A.R., and until illness confined him to bed on December 19, he played an active part as the dean of patriotic organizations in this city. He participated in the annual parades until recent years, when the line of march was routed by his home where he greeted the procession from the porch. 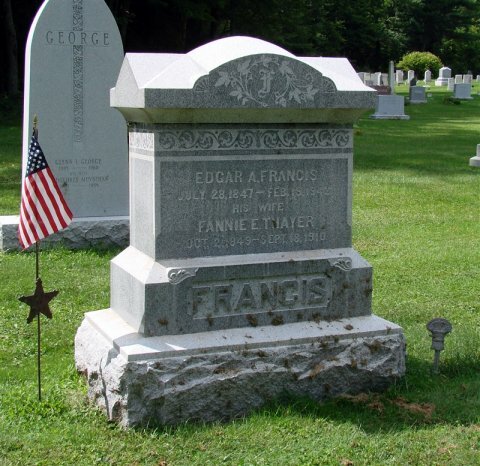 Comrade Francis enlisted in the Civil war at the age of 17 and saw active service. He provided interesting stories for younger generations of those years of duress. He was a carpenter and contractor by occupation and built many residences in this section. He is survived by one daughter, Mrs. Wesley Turney of Websterville, by his first marriage; one granddaughter, Mrs. Herbert Thresher of this city; and two great grandchildren, Howard H. Thresher of Montpelier and Mrs. Glen Rogers of Burlington. He leaves two cousins in East Montpelier, William and Fred Jackson and several others who reside in Canada. Funeral services will be from the Barber and Lanier home Saturday afternoon at 2 o'clock with the Rev. G. Lewis Porter officiating. Friends may call at the Thresher home until the time of the funeral. Entombment will be in the Green Mount vault to await burial in the North Branch cemetery in the spring. Military Record: FRANCIS, EDGAR A. Credited to East Montpelier; enlisted for one years and mustered in as Private, Co. C, 2nd Vermont Infantry, 8/20/1864; mustered out 6/19/1865. Source: Two undated newspaper clippings from a Montpelier area newspaper, the first c1940, the second late February, 1942; Revised Roster, 44. Contributed by: Richard Cooney, Worcester, Mass., Edgar's 2nd-great-granduncle and Joyce Cooney Flint, Edgar's 2nd-great-grandniece.